Sterling Price led an expedition into Missouri which Union forces under Maj. Gen. Samuel R. Curtis and Maj. Gen. Alfred Pleasonton finally countered around Kansas City, Missouri. 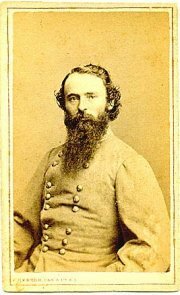 Price withdrew south, and Pleasonton, commanding in the field, pursued him into Kansas and fought him at Marais des Cygnes. After an artillery bombardment that began at 4:00 am, Pleasonton’s men attacked furiously. Although outnumbered, they hit the Rebel line, forcing them to withdraw. The Battle of Marais des Cygnes took place on October 25, 1864, in Linn County, Kansas during Price's Missouri Raid in the American Civil War. It is also called the Battle of Osage, and the Battle of Trading Post. 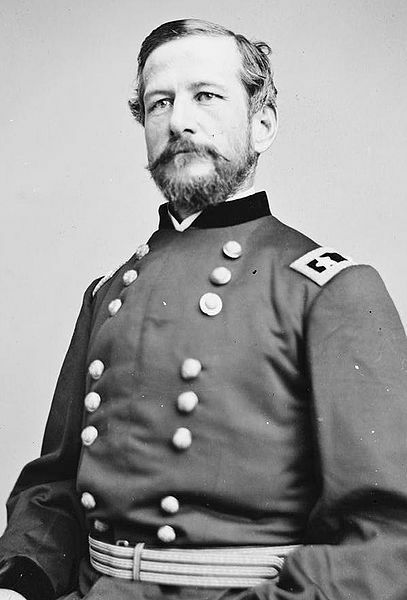 It proved to be the first of three interconnected actions on this same day, all involving elements of Major General Sterling Price's Confederate Army of Missouri and the Union's Provisional Cavalry Division commanded by Major General Alfred Pleasonton. During this battle, two brigades of Pleasonton's cavalry under Colonels John Philips and Frederick Benteen caught up with Price's rear guard as it covered the crossing of the Marias des Cygnes River by the Southern supply train. Though unable to prevent the crossing or inflict serious damage on Confederate forces, Pleasonton's troopers did manage to capture 100 prisoners and two cannon, forcing Price to continue his retreat. This led in turn to a second engagement at Mine Creek later that morning, followed by a final battle at Marmiton River in the afternoon. The three Union victories won on this day sealed the fate of Price's campaign. 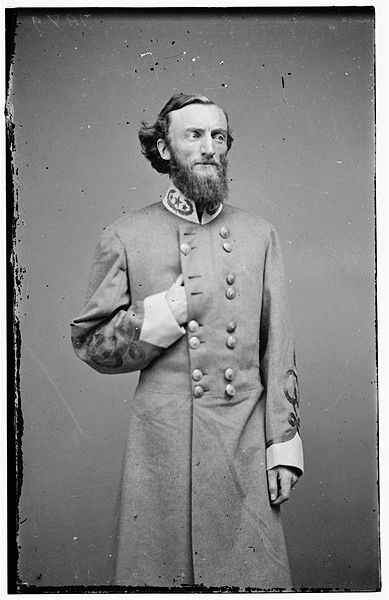 Major General Sterling Price had led an expedition into Missouri seeking to capture that state for the Confederacy, or at least to negatively affect Abraham Lincoln's chances for reelection in 1864. After a series of several battles across that state, Union forces under Major Generals Samuel R. Curtis and Alfred Pleasonton finally defeated Price decisively at the Battle of Westport, in modern Kansas City, Missouri. Price withdrew south toward his base in Arkansas while Pleasonton, commanding a Union cavalry division, pursued him into Kansas hoping to capture or destroy his army before he could reach Confederate territory. General Price's retreating army was hampered by the presence of a rather large supply train, containing upwards of 500 wagons partly filled with desperately-needed war supplies for the South. Coming to the Marias des Cygnes River, near a place called Trading Post, Price decided to camp along a ford in pouring rain. Hard on his heels, Pleasanton's cavalry reached Price's encampment early on the morning of October 25th. At 4am, his artillery opened fire, followed by a furious Union attack. Price ordered his troops to cross the river immediately, leaving Brigadier General James Fagan to hold the attacking Federals back until he could extract his wagon train. According to one account, the Confederates abandoned their camp so rapidly that attacking Union cavalrymen came upon campfires with meat still cooking on spits above them. Confederate rifle fire was mostly ineffective, as the Southerners were camped on a high ridge about two-hundred feet above the approaching Federals, and their shots mostly sailed over the attackers' heads. Although the Northerners were unable to prevent Price's rearguard from crossing the river, they did capture about one hundred prisoners and two cannon. Undaunted, the Federals continued across the Marais des Cygnes in pursuit of Price, though this was delayed due to the rain and swollen condition of the river. William Forse Scott, a Union participant in the battle, wrote in The Story of a Cavalry Regiment: the Career of the Fourth Iowa Veteran Volunteers that as he and other cavalrymen were crossing the field adjacent to the Confederate encampment (having just driven the Rebels across the Marais des Cygnes moments before), they came across a terrified six-year-old girl hiding in some grass. She was clutching a schoolbook, and had apparently become lost while trying to avoid the Southern soldiers camping near her home the night before. Amazingly, she had been lying between the attacking Federals and Price's force, but was unhurt and undiscovered until Scott stumbled upon her. The girl, whom Scott did not name, was taken to the nearest house and turned over to the occupants after assuring Scott and his compainions that she could make her way home from there. About six miles south of the battle site, Colonels John Phillips and Frederick Benteen, commanding Pleasanton's two cavalry brigades at the Marias des Cygnes engagement, caught up with Price's wagon train as it struggled to cross Mine Creek. The resulting Battle of Mine Creek would prove to be one of the largest cavalry engagements of the entire Civil War, resulting in the loss of two Rebel generals, and a significant portion of Price's train.